Freshman Addie Steiner will be one returner Northwestern relies on in its next season to bring back experience from this year’s sound disappointment. 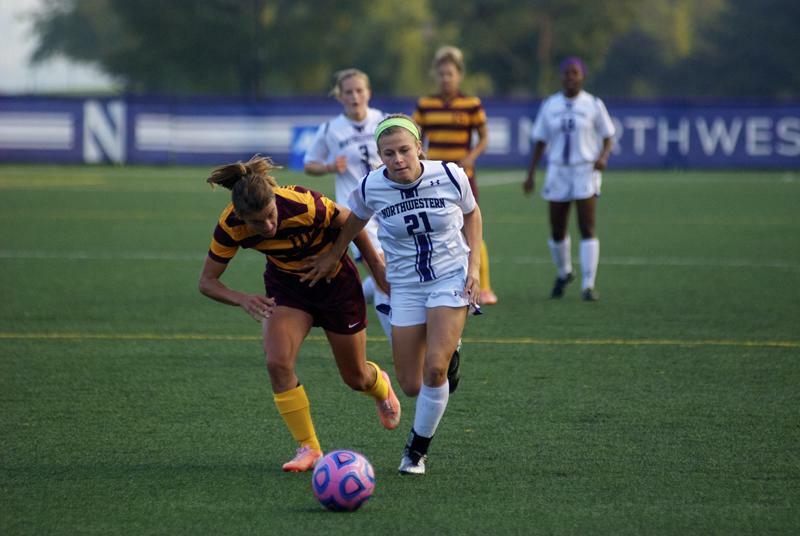 The forward scored her first collegiate goal during the Wildcats’ sole conference victory versus Minnesota. After a disappointing season, Northwestern limps to the finish line this weekend as the Wildcats head to Madison to take on the Badgers. Wisconsin (9-6-2, 4-5-1 Big Ten) currently ranks eighth in the Big Ten, and a Wildcat upset could prevent the Badgers from making the Big Ten tournament, for which only the top eight teams in the conference qualify. NU knows it can still make a difference. Landgrebe is ready to take on more of a leadership role next year in her senior season. She is willing to do anything she can to help the team win and looks forward to more success. Freshman forward Addie Steiner also sees a brighter future for the Cats. Although strong players are coming in, great players are also on their way out. Senior forward Kate Allen has cemented her place in the NU record books. She ranks third all-time in career goals and points and tied for tenth in assists. Allen was also recognized as a 2013-14 Capital One Academic All-District honoree by the College Sports Information Directors of America on Thursday for her performance both on the field and in the classroom. The returning players realize the shoes they have to fill. “These seniors have meant a lot to me,” Landgrebe said. “I hope that they can look back at Northwestern and see improvement in the women’s soccer program,” she added. Regardless of the outcome of this weekend’s game, Moynihan remains proud of what this team has accomplished. He said the Cats have come incredibly close in many of its losses and has been unusually unlucky. Had a few minor things gone their way, this could have been a very different season, Moynihan said. Moynihan also looks forward to next season, knowing the best is yet to come for his squad. He credits this year’s seniors with playing a critical role in the team’s future success, citing their leadership, teamwork and spirit with setting the right example for this group moving forward. “Between the fight and the team spirit, I think the sky is the limit for us,” he said.